Researchers at Caltech have developed a prototype miniature medical device that could ultimately be used in "smart pills" to diagnose and treat diseases. A key to the new technology–and what makes it unique among other microscale medical devices–is that its location can be precisely identified within the body, something that proved challenging before. Called ATOMS, which is short for addressable transmitters operated as magnetic spins, the new silicon-chip devices borrow from the principles of magnetic resonance imaging (MRI), in which the location of atoms in a patient's body is determined using magnetic fields. The microdevices would also be located in the body using magnetic fields–but rather than relying on the body's atoms, the chips contain a set of integrated sensors, resonators, and wireless transmission technology that would allow them to mimic the magnetic resonance properties of atoms. The researchers say the devices are still preliminary but could one day serve as miniature robotic wardens of our bodies, monitoring a patient's gastrointestinal tract, blood, or brain. The devices could measure factors that indicate the health of a patient–such as pH, temperature, pressure, sugar concentrations–and relay that information to doctors. Or, the devices could even be instructed to release drugs. "You could have dozens of microscale devices traveling around the body taking measurements or intervening in disease. These devices can all be identical, but the ATOMS devices would allow you to know where they all are and talk to all of them at once," says Shapiro. He compares it to the 1966 sci-fi movie Fantastic Voyage, in which a submarine and its crew are shrunk to microscopic size and injected into the bloodstream of a patient to heal him from the inside–but, as Shapiro says, "instead of sending a single submarine, you could send a flotilla." The idea for ATOMS came about at a dinner party. Shapiro and Emami were discussing their respective fields–Shapiro engineers cells for medical imaging techniques, such as MRI, and Emami creates microchips for medical sensing and performing actions in the body–when they got the idea of combining their interests into a new device. They knew that locating microdevices in the body was a long-standing challenge in the field and realized that combining Shapiro's knowledge in MRI technology with Emami's expertise in creating microdevices could potentially solve the problem. Monge was enlisted to help realize the idea in the form of a silicon chip. While the current prototype chip can relay its location in the body, the next step is to build one that can both relay its location and sense body states. 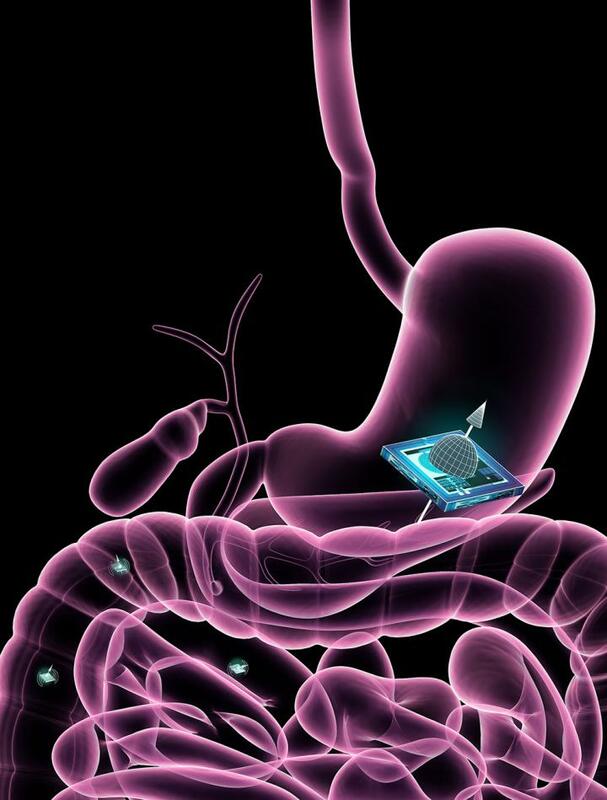 "We want to build a device that can go through the gastrointestinal tract and not only tell us where it is but communicate information about the various parts of the body and how they are doing." The Nature Biomedical Engineering study, titled "Localization of Microscale Devices In Vivo using Addressable Transmitters Operated as Magnetic Spins," was funded by the Heritage Medical Research Institute, the Burroughs Wellcome Fund, and Caltech's Rosen Bioengineering Center graduate scholarship.